Growing up, I used to love hanging out in Bangsar Shopping Centre and did a lot of part-time jobs there when I was a student. I knew every corner of the place; right down to which toilet was the cleanest and the most vacant. The newly revamped mall is a lot bigger and swankier, but it has also become less nostalgic for me. Walking around, I saw an ad banner that said “Frozen yogurt”, which lead me to Tutti Frutti. 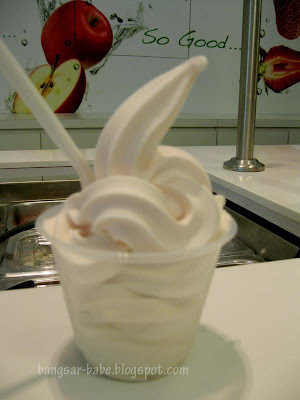 Tutti Frutti is a popular premium soft-serve frozen yoghurt from America. 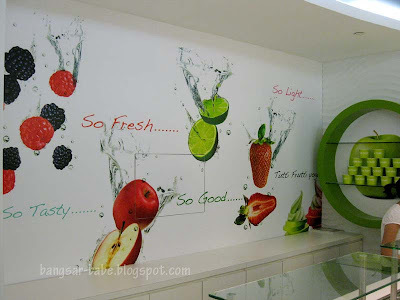 It has a “grab and go” concept, where you make your frozen yoghurt based on your preference. The yoghurt is priced at RM5.30 per 100gms. There are 8 flavours available — original, strawberry, mango, taro, kiwi, blueberry, vanilla, and chocolate. 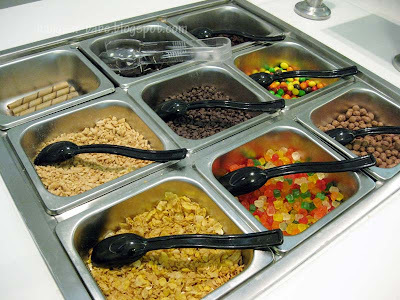 After you fill the bowl/cup with your chosen flavour and toppings, proceed to the counter to weigh the bowl. I chose the original and strawberry flavour, and skipped the topping. If I were to be healthy, I might as well do it all the way. My small cup cost RM11.80. I liked my flavours; they were creamy yet healthy-tasting. A refreshing change from the fattening ice creams I usually go for. I sampled the chocolate and taro flavour, which tasted like chocolate and yam ice cream. The yoghurt is low in fat and calories, so it’s great for those who are watching their weight. The pricing isn’t so great for the wallet, but come to think of it, healthy food don’t come cheap. Verdict: Healthy desserts that are easy on the waistline, but not on the wallet. Oh! I didnt knw they opened here! I wanted to go the Sunway Pyramid one cos I read in the papers tht it was there? did i read wrongly? New BSC become less nostalgic for me too..
yeah healthy food is never cheap..
can not let my kids see this, they sure want some !! Merry Christmas !! 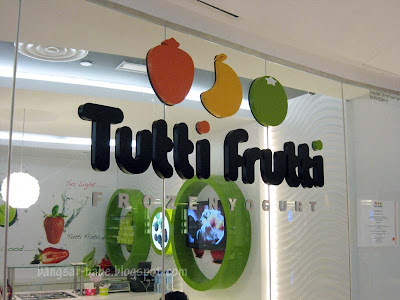 Like it 🙂 Here in Jakarta, at the TF shop, the staff usually will shout, "Tutti Fruiti" repeatedly and give samples to attract people to come. leo – Go jalan-jalan there again. Sure got new things to see. Sonia – LOL…not good for the wallet, especially with kids. 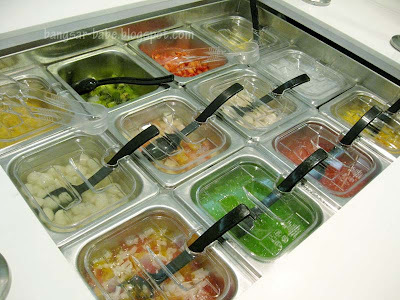 They would want to add toppings…which will cost a lot more! vialentino – It's actually not too sweet — the plain flavour especially. Go try the sample la! joe – Sad isn't it? Nor Ramli – Yup…it has lost that old charm I love. There's one open in Taman Tun. There is one at Tropicana City Mall, they are giving out samples to taste the yogurt before you buy. Just let the crews know that you want to sample them. This coming Oct they are also giving out 20% off from Mon-Fri 12noon-3pm. Only at Tropicana City Mall.